August is flying by and back to school is rapidly approaching. Teachers everywhere are preparing their classrooms for the students' return and many might have even headed back already. However, even if the students have already arrived it is not too late to add a cozy reading nook to your classroom to encourage them to read. Sterilite can help with some affordable and functional additions to organize your books and reading aids for silent reading time. The key component of a classroom reading nook is obviously the books. Gather all your children's books in a designated area in your classroom and sort them so that students can easily make their selection. Sorting by reading level, genre or author are all good options depending on what grade level you teach. For an affordable and modular shelving solution, try using Sterilite's File Crates. They have a unique joining feature allowing them to stack on their sides as a shelving unit. A benefit of using crates is the shelves are broken into smaller pieces that can aid in the organization of books. Sort each piece of your collection into its own crate so students can find what they are looking for. In addition, it is easy to add more shelving capacity. As your collection grows, simply add additional crates. If working with young and mischievous children be careful not to stack them too high, and consider zip tying them together as an added precaution. Create a kit of tools students can use as they read to improve their comprehension. Some potential items to include are bookmarks, pencils, sticky notes, and guided reading questions. Students can use the bookmarks as pointers to help them focus as they read. They can point at each individual word, or lay them across the page to concentrate on one line. The sticky notes coupled with the pencils are a convenient and fun way to take such notes while reading as unfamiliar words that students need to look up in the dictionary. Finally, add some guided reading questions that will aid comprehension and deepen understanding. To make the questions a little more fun, turn them into wands by pasting them onto popsicle sticks. To keep the kit organized and the items accessible, use Sterilite's 20 Ounce Tumblers which fit perfectly inside the Sterilite Mini Crate. Place each supply in its own tumbler and place them all together in the crate. A final step to make silent reading a little more exciting for your students is to offer some pillows and stuffed animals they can borrow. Allow them to take one item and ask them to return it after they finish. 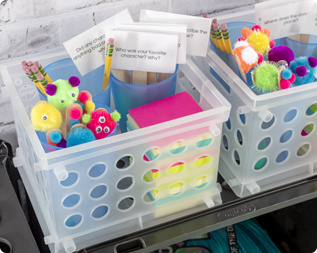 Storing all of your pillows and stuffed animals in a Sterilite 2 Bushel Ultra™ Laundry Basket will keep them organized, and the wide opening of the basket will make it easy for students to access them. It is important to set a couple of ground rules to keep the students focused when reading with the stuffed animals. Such as, they must read the whole time, and their buddy can sit next to them, on their lap or in front of them but they must be reading not playing with their buddy. Creating a cozy reading corner in your classroom is a great way to make silent reading time something your students look forward to and help instill a love of reading. Helping students to enjoy reading and improve their comprehension will benefit them for years to come. 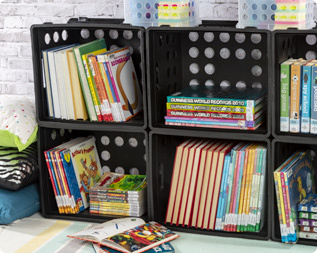 Sterilite's File Crates' unique joining feature allows them to stack on their sides to create an affordable shelving unit for children's books. Assemble a kit of reading comprehension tools so students can easily access them. 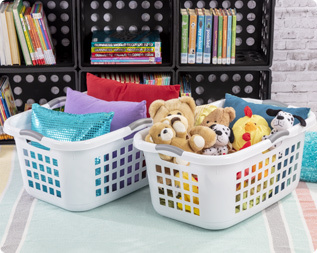 A Sterilite laundry basket is a handy way to gather stuffed animals "book buddies" that students can read with.